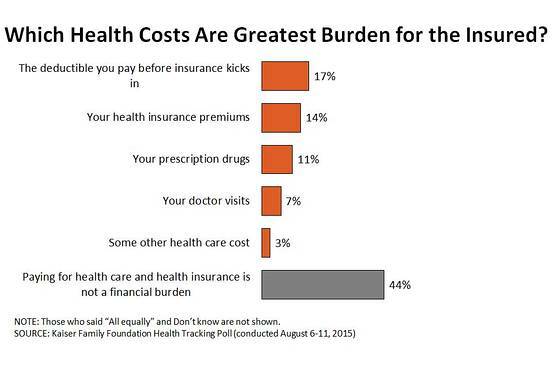 Which Health Costs Are the Greatest Burden? Drew Altman: “In our August polling, we asked which health costs people with health coverage find to be the greatest burden. As the chart below shows, deductibles led a closely bunched list, followed by premium payments, drug costs and doctor visits. Deductibles have been rising steadily each year, especially for people who work for smaller employers, as insurance has gradually been moving from more to less comprehensive, with more ‘skin in the game’ for consumers.